Subtract 14 from both sides. Substitute u for w2 - 5w. Write each equation in standard form. 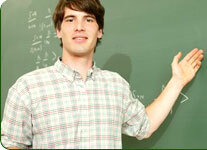 Then, use the quadratic formula to solve each equation. The equation (w2 - 5w)2 - 5(w2 - 5w) = 14 written in standard form is (w2 - 5w)2 - 5(w2 - 5w) - 14 = 0. 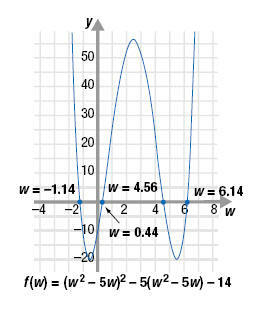 The graph of the corresponding function, f(w) = (w2 - 5w)2 - 5(w2 - 5w) - 14 is shown.